This page is for reenacting tech and tips that all reenactors of all eras can use to help with there impression. Magazines, Books, websites and more! Be careful when buying Reproduction German uniforms and gear from china, off ebay sellers. Many times the quality is very poor, and reenactors are having sitching coming undone, buttons pop off often, and the wool used is a very thin cheap wool. Take the time to do some research before buying! For living historians and military buffs, fall means one thing: reenactment season. The practice of dressing in period military uniforms and safely reenacting battles with weaponry and vehicles from the past is popular this time of year leading up to Veterans Day. While it may seem like a modern-day hobby, reenacting is a tradition that dates back to the Roman Empire. Today, Civil War reenactments are the most popular genre in America, especially during the sesquicentennial of the Civil War that ends this year, says Kent Berg of the Living History Reenactment Association, a national organization. However, World War II reenactments are becoming more popular in the Midwest, says Berg. He estimates that 5,000 people participate in WWII reenactments in the U.S. and even more around the world. There are several WWII reenactment groups and reenactment locations in the Chicago region. They include the WWII Historical Reenactment Society, and the Central Illinois WWII Reenactors. Midway Village and Museum in Rockford and the Lockport Township Park District hold WWII reenactments. “The Midwest is the mecca for WWII reenacting,” says Rich Russo of the WWII Historical Reenactment Society. WWII reenacting has a wider array of large “props” to draw upon than Revolutionary War or Civil War reenacting because of the sheer number of automatic weapons and war vehicles that were available by then. It has the infantry combat aspect but also the mechanical aspect, Russo explains. First-time spectators might be surprised by the wow factor. To produce a recent event, Russo partnered with Ed LeTourneau, executive director of Salute the Armed Forces, a nonprofit dedicated to help returning veterans transition to civilian life. The reenactment included battles between 400 German and American infantry. It featured working tanks and other rare war vehicles such as a German Horch (similar to a Humvee), authentic weapons such as a 50 caliber machine gun, and vintage military aircraft flying “bombing runs” over the battlefield. A pyrotechnics team coordinated by LeTourneau, who has movie experience, provided live gunfire and explosions. The reenactment drew 10,000 spectators. Russo says reenactors and collectors love to share their memorabilia, restored vehicles, and research with the public at reenactments and living history presentations. In the past 21 years he has learned about everything from the role of carrier pigeons in WWII to German battle whistle commands to the different ways American and German soldiers held their cigarettes. “It is amazing how many individuals are willing to spend their own time and money acquiring, restoring and transporting these things to events,” Russo says. This is especially tricky when it comes to 30-ton tanks, which must be brought in on tractor trailers and can cost thousands to transport. So why bother to repeat history? Reenactors say they are preserving it — both physically in artifacts and culturally through stories and research. “This is living history that the public can see up close and touch. It’s an experience that they cannot get from movies and books,” Berg says. Both Russo and LeTourneau had relatives who fought in WWII but died before their stories could be fully told. Since there are so few WWII veterans around these days (an 18-year-old in 1941 would be 92 today) it’s a race to preserve their memories, they say. Reenactments can bring out this hidden side of history, especially when veterans attend. It’s also an opportunity for veterans to connect with each other. Kyle (last name withheld upon request), a 31-year-old Iraq and Afghanistan veteran from Rockford, has been reenacting since he was 16. He says the best part of a reenactment is the camaraderie among his unit and the connections they make with the veterans who attend the events. For example, at a 2012 event Kyle witnessed a German veteran who was a tank commander meeting a former Russian tank commander. If you’re interested in watching WWII living history, it’s not too late. The Battle of the Bulge, the last great German offensive of WWII, will be reenacted Dec. 12 at Sommer Park in Peoria by the Central Illinois WWII Reenactors. Visit centralilww2.com for details. These are various vendors selling items for the Military reenactor. The LHRA does not endorse them, but provides this service for its members. Always do the research before buying. WWII GEAR: www.ww2gear.com WWII uniforms, field gear etc. WWII Impressions: www.wwiiimpressions.com WWII uniforms, etc. Quarter Master shop: www.quartermastershop.com Civil war, and earlier uniforms etc. Birstol Hollow: www.bristolhollow.com Rev war uniforms and more. 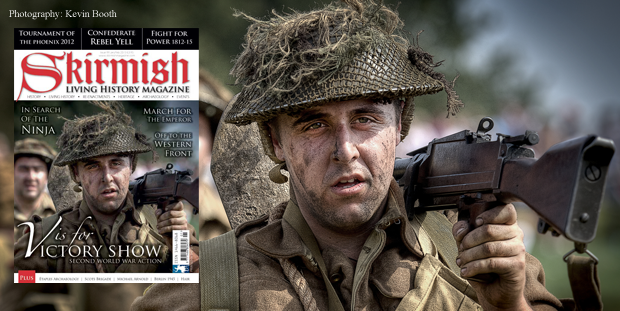 Skirmish Magazine: A UK based magazine, they deal with all eras reenacting. You can find it in most major book sellers here in the US, or you can subscribe on-line. http://www.skirmishmagazine.com/ https://www.facebook.com/SkirmishMag. 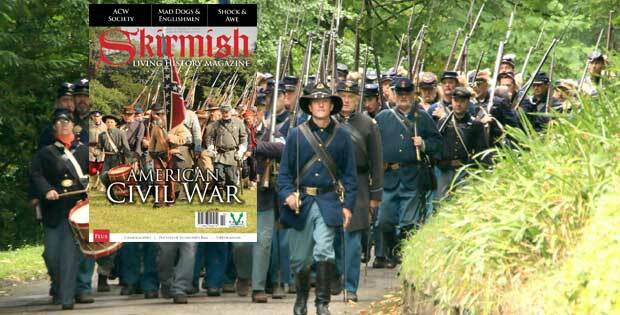 TIP: This link is to a YOUTUBE video for US Civil war reenactors, deals with impressions. Civil War Cavalry Reenacting: The Basics (Intro #1) https://www.youtube.com/watch?v=iPIEOZwstuY. Clothing/Gear Introduction https://www.youtube.com/watch?v=ov5wZ-gfQxc.